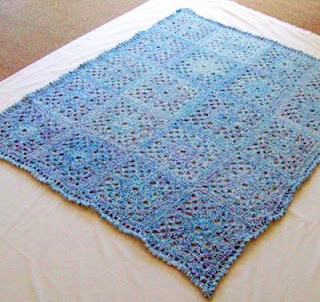 Jan's Geo-Glow Site: Blue Lace Afghan is DONE and Listed for Sale! A few weeks ago, I tempted you with pictures of my Blue Lace Afghan in progress. At that time I only had four squares sewn together, and a few more in half-completed. 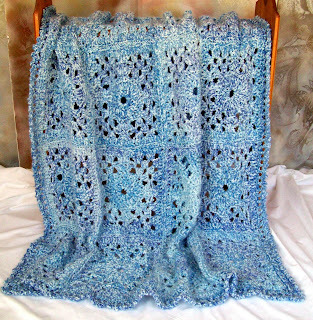 Now I'm happy to announce ~ Blue Lace Afghan is DONE and she's available for purchase at my Zibbet shop! This afghan is truly a beautiful way to keep warm this winter! The velvety-soft, excruciatingly-thick texture just begs to be touched. 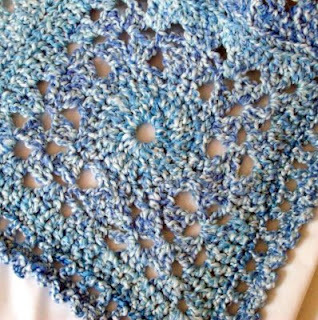 Best of all - for all its beauty - Blue Lace Afghan is a trooper that can be machine washed and dried, and will last a lifetime looking as beautiful as the day she was finished! In the pictures below, you can see how the yarn's delicate shades of frosty blue drift pleasingly across the afghan. 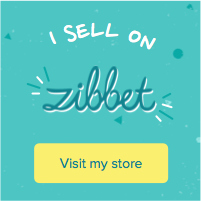 Now, if blue is not your color - talk to me! This pattern can be made in your choice of a HUGE range of colors. The size can be adjusted, and the border can be changed to give a more unisex appearance. This is a piece that can be customized to your specification! 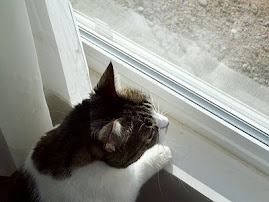 Just end an email to burchjan@gmail.com with your request, and we'll take it from there! In this picture, you can see the fine stitch pattern with the varying shades of blue. Remember, you can choose your color on custom orders And don't let the "holes" in the pattern make you think it's drafty. This super-thick and soft, afghan-friendly yarn will keep you cozy on those chilly winter nights!